I've been printing for 3 days now to make the full set for my kids to play with (will definitely post my make when I finish). But I was curious if there are any plans for an actual castle type structure? 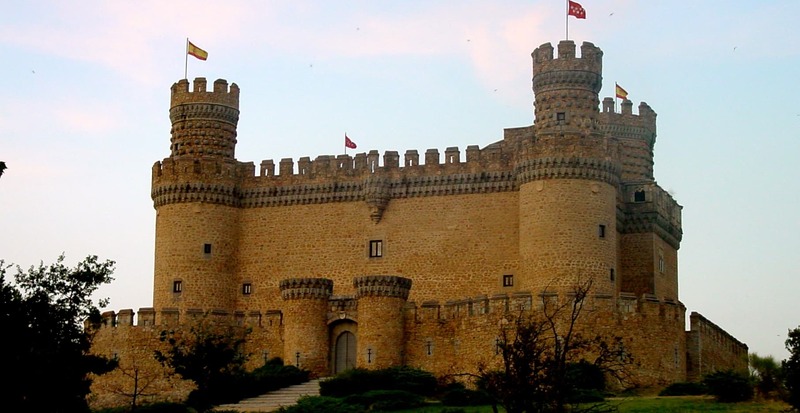 Or maybe taller wall sections to make a castle in the center of an outer wall? thanks for your interest in the project. I spent a lot of time creating it. Feels like we posted it yesterday but its already been 2 years. For now there is no plans to add files. We might come back to it and some point. The beauty of this project its that its quite easy for anyone to use there own models in conjunction with what we already created. @Bikecyclist additions is a great example of this. What would you consider an "actual castle type structure"? A huge square donjon? A "palas"-style representational hall? Or something else altogether? The attached photograph shows a couple of modules I designed assembled into a solitary tall round donjon. I could probably redesign it into a square one with a more "Norman" look fairly easily. Tall walls are a good idea, but a bit tricky if everything is to be nicely modular. I'll have to think about this! The parametric castle tops work, but I think a wall that is twice as tall as the normal wall would help to complete a center castle type structure. It would be easy to make a double-height wall, but the existing parts don't interface well with that, so it wouldn't be properly modular. Gaps between high walls and towers etc., as the interface is only defined at lower level. Thinking about it, maybe "flat-topped" standard walls could solve some of the problems. Basically a standard wall cut off a bit below the merlons, and with vertical pins so that you can put another standard wall on top of it, or a section of merlons to get it to standard height. This is my first comment in many years here and this design is fantastic! If I had a child I'd definitely buy a printer to make this one! Thanks for so amazing work! Hi, could you make a toy soldier like figure? A technical question: What is the conical hole in the connecting face of wall and tower modules for? And what glue do you use? from the zip "3DCastlePlayset-_Wall_components " with Cura. But the they dont fit together. The Butterfly Connector is somehow to short, so there is no place left between, the wall and the Tower to tuck them together. Some other Guy (theadam on Jun 6, 2017 ) wrote the same Problem here. But does someone have an suggestion why it is so? And how to solve this? I haven't printed it yet, but it's designed to the same dimensions as the original one, and will extend under pull, so I'm confident it will do the job. After testing my spring connector, it was an improvement over the original connect, but still had some disadvantages. It now prints easily laying flat.  This means the layers of the connector now run at an almost perpendicular angle to the castle pieces (which are usually printed upright), so it's far easier to insert and remove the connectors. You need no brim anymore, which also helps insertion and removal, and saves you the effort of finishing them. The spring, which has to follow the layers, now has more give without danger of breaking. The connector is smaller and only contacts the surfaces defining the connection, so it doesn't rub against any other surfaces. I will gice it a try. It looks good. Great work! One of the finest projects I have found on Thingiverse. I am currently using MatterControl to slice and print my stuff and I am getting tight fit on some of the designs. I have found out that Slic3r and MatterControl's own slicer provide tighter fit (to a point where I have had to extensively sand down the design to make it fit with a lot of force), while Cura gives a more fitting results. Cura, at least in MatterControl, is offering fewer settings though. Any hints on what to do to make the items fit more? I.e. castle wall joints fit snuggly, but connecting 2 walls with it is impossible, there is not enough room there. I am pretty sure this has sth to do with my settings. Can anyone offer hints on this? where could I find a set of people for this? It includes some animals, but not humans. also it is missing cats and dogs. I am looking to get a home 3D printer instead of a school one. do you have a canadian counterpart, or a suggestion of one? Thanks for your feedback. We have made a soldier as human. For other kinds, you could search Thingiverse for other human 3D models and scale them down accordingly. I also see no human soldier parts. My booth little girls (and in meantime myself also) love to play with the castle. It would be wonderfull if you could provide it. Thanks a lot for the link to the photograph! Check out the clever LEGO adaptation of the wall segment, made by Phil Val. Seems to be a problem in Simplify, but Flashprint, Cura and Makerbot print works at the moment. (at least for me). Gonna try to fix it. Edit: was a few versions behind in Cura can slice it in 2.4. Edit 2: Seems to be a weird error in the mesh but fixed it using netfabb. Will ask the boss to upload the repaired model when he can. If you want to fix it yourself load the model into netfabb (you can get a 30 day free trial). Click the "red cross" on top of the UI. This will take you to a new workspace. In the bottom left click "Automatic repair" and choose the "extended repair" option. You will jump back to the normal workspace. Right click the model and export as stl. Great! I don't see the extended repair option, I guess that's because i'm using the free version? The new file Jousting_Tent_Modular_Castle_Playset_v02.stl can now be downloaded. May I ask what filament you are using for the light brown items? I don't see how the cannon works, in the video you seem to pull it back and it snaps back in place, but I can't see why it would do that. Thanks for asking. The shaft of the cannon springs back to the original position with the help of a metal spring. The kind found commonly in pens. No inspiration from Crossbows and Catapults the board game?? Stoning project ! Impressive ! Very nice work ! Muito obrigado Paulo! :) We are glad you liked the #3DCastlePlayset. Thanks! Just printed the catapult and the holes where the frame goes into the base seem a little large. Should they be a tight fit? Thanks for your feedback. :) Tolerances can vary between different printers, materials, and settings. If you experience that the holes are too large, we recommend you to glue them together using commonly available wood glue. Wow, these are fantastic, keep it up. We're happy to say that the dragon now can be downloaded! Can you add files for the dragon and maybe make some more creatures, like an ogre/troll or maybe a griffon? The dragon is now available for download. Sure :) We will release them this week Please stay tuned. Is there any diagram on how put all the walls and tower together? There seems to be more parts than shown in the photos. I want mine to look like in the photo and don't want to print any of the extra pieces. You can now download the file #3DCastlePlayset - Wall components.zip, which includes all STL files for the wall section and an explanatory PDF chart. Do you need supports for the tower? Allt the towers and wall parts in this playset are 3D-printable without the need of support structures. Thanks. Looking forward to printing this! This was one of the first things I saw on Thingiverse and one of the first things we started printing. In black at first but now in semi-clear (it looks wicked with lights under it!). Absolutely love this project! A potential area for new parts would be angled corners at 60 and 120 degrees. Thanks for your comment and suggestions Fenriq! We are glad you liked it. Checkout the first remix of the #3DCastlePlayset! The clever idea to add stairs to the wall section. So excellent, thanks for sharing it, it'll fit in perfectly! How hard would it be to make one with the stairs going the other way as well? Thanks for your suggestion. This is easily done in a 3D software such as Autodesk netfabb. You can watch the video below for instructions. Amazing work!!! i have a question, the color of wall is gray or white ? PLA, PETG or ABS ? very nice job indeed! it must have taken many many hours to print all of these things. it looks great i may have to follow you and begin a whole kingdom for myself lol. great inspiration and this will be so many great hours of playing and using imagination for kids. thanks for taking the time to post and share it. Thank you Thomas for your kind words. We are very glad you liked the castle! Stay tuned for more stuff that we will release to add to this playset. Thanks for your kind words :) We are glad you liked this project. Cool tune in the background - what is it called, as I would like to buy it - super cool set of files! :) We're glad you like the castle! A part of this "print-your-toys-at-home" project, was also to evaluate the cost of making toys in your home using a 3D printer, instead of buying mass-produced toys from the store. Can you post the white knight? Can you post the file for the dragon? The rest is so cool! What a set...thank you for offering this up!!! OMG the poor printer, good thing i have a second one on the way!! The grandkids are gonna go nuts with this. Many thanks to those who have taken the time to create all this and then post it for public use, just amazing!!!! That sounds great! :) We hope your grandkids will enjoy playing with the castle. Very excited to look into this one. Although I am worried about which items exceed my 120x120x120 build area. Thanks, I will look into it. I'm still fairly new to owning a printer and the list of things to learn continues to grow. Thank you for the reply -- I'll give it a shot soon. Again, great project and it will be great to work on it with family. That really is impressive. I used to have a game as a kid called crossbows and Catapults. came with an elastic band powered crossbow and catapult for each player as well as some projectiles to go with so you could knock over each others figurines. that would be cool. No way, I have to popularise your playset to Czech 3D printer community (http://www.3d-tisk.cz/tip-na-3d-tisk-pojdte-si-hrat-s-modularnim-hradem-pro-vase-deti-ci-kobkami-pro-hrdiny/). ;) Maybe my daughter will replace lego with a new castle too. Thanks for the kind words Tomas :) and for sharing it to the Czech 3D printing community. Will do! :) Thanks for your suggestion Chris. Thank you all for your kind words. :) We loved making this playset and will continue to update this thing with new compatible parts, such as a drawbridge as suggested by Thingiverse user "onelayeratatime" below. Excellent model! Certainly deserves to be featured. This is amazing, great job on the build and design. Maybe some kind of bridge or drawbridge? All files are now uploaded to this project. Please follow us and stay tuned for future parts we add to the #3DCastlePlayset. Today you can download the fence STL files for the #3DCastlePlayset to keep your animals in place. 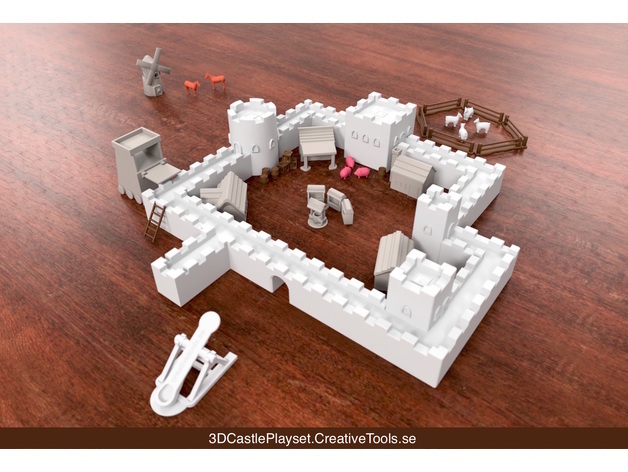 The #3DCastlePlayset is now updated with STL files of the horse and a tree. The house with chimney is now available as an STL for you to download for your #3DCastlePlayset. You can now download two new props for the Castle - The barrel and the wooden crate. Fun fact, the pig was printed with white PLA, then painted with miniature paint. New STL files added to the #3DCastlePlayset. You can download a house with shed roof. what about the round type jousting tents and a jousting arena? Jeremycon! :) Your wish is our command. Today’s update - a jousting tent you can download for the #3DCastlePlayset. 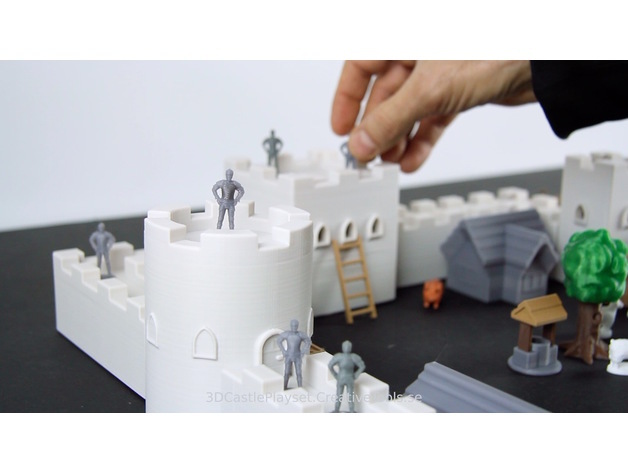 Today you can download the ladder to climb the walls of the #3DCastlePlayset. New STL files added to the #3DCastlePlayset. Download the T-jont and end section for the walls. New STL files added to the #3DCastlePlayset. Download the wall intersections. New STL files uploaded! Now you can 3D-print the round wall towers. What print settings do you recommend? Great! Do you think you could add this in the "summary" section? There is such a section now for print settings. New STL files uploaded! :) Now you can 3D-print the wall and scout towers. New STL files uploaded! Now you can #3Dprint the wall corners. Nice going Tim! Looks swell :D I'll have to come by and check it out. Why not add an observatorium with like a huge telescope which you can spin around? Sciency castle! Thanks for the kind words :) We are glad you like it! 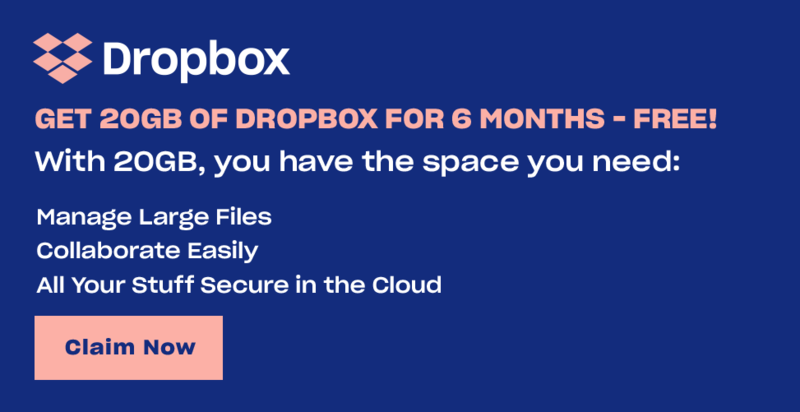 More files will be uploaded continuously and also improved with user-feedback. So awesome!! My 6 year old will love these!! Modular Castle Playset (3D-printable) by CreativeTools is licensed under the Creative Commons - Attribution - Share Alike license.